Falls remain the number one killer in Construction. Try as we might, we seem to have difficulty changing that fact. The overwhelming majority of fall fatalities occur because the worker was either not provided with proper fall protection, was not trained in its use, or chose not to use it (as opposed to, say, equipment failure). The problem is: fall protection solutions are not always easy. Finding a harness and lanyard might be simple enough, but where am I tying off? If I’m on a roof, for instance, is there anything to which I can tie-off? There was a time where, short of a parapet high enough to fulfill OSHA’s requirements, the answer to this question in regards to roof work was almost always “No”. Perhaps the only structures on the roof were PVC pipes or large mechanical units with no piece to which you could secure your harness. That’s if there were any structures at all. 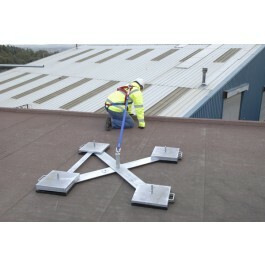 The only option often turned out to be a warning line and monitor system, which is not really fall protection at all. However, as technology improves, the “No” answer becomes less and less frequent. No longer do we need an existing structure. No longer do we need to penetrate the roof. 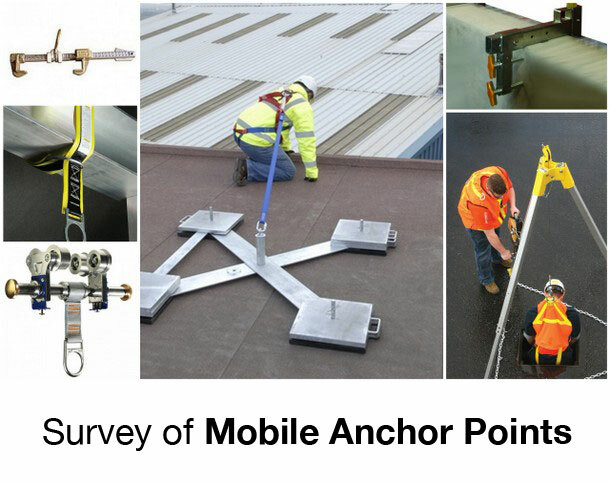 Technology has brought us a wide array of mobile anchor points that can help solve many of your most difficult fall protection situations. NOTE: Anchor straps are specifically designed for fall protection use. You may NOT substitute rigging slings of any kind. Also, remember that in this situation, you are using the strap around steel. Make sure to protect the strap from the edges if it is not a strap with built-in abrasion protection. Be sure to keep in mind the rating of the strap. 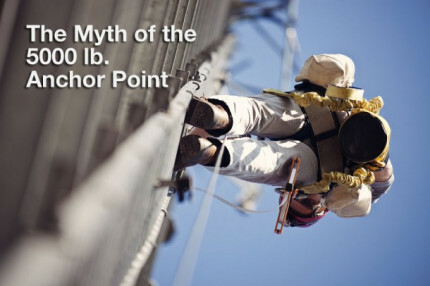 This form of anchor point, just as any other, must be able to support 5,000 lbs per employee attached if being used as part of a fall arrest system. Connecting more could render this solution ineffective. Tie-back lanyards are similar in concept except, instead of a separate piece of equipment, these lanyards are designed to wrap around your anchor and tie back to themselves. Since this is a major “no-no” with regular lanyards, it is important your employees are trained how to determine which type of lanyard they have. Speaking of beams, structural steel is a great option when looking for an anchor point (not decorative steel or roof joists, necessarily, but good, strong, load-bearing steel beams). If your work is fairly static in location, you can get a beam clamp and if you need to travel, you can get a beam trolley. Both work under the same principle in which they tighten around the wider part of the beam, but the trolley has rollers. Can I get to the steel without putting myself in a fall hazard situation in the first place? Is the steel beam at or above D-ring level to reduce my freefall distance to less than 6 feet? Similar in look and design to fall protection stanchions that penetrate the roof membrane to be attached to structural steel below, the mobile weighted anchor performs the same task without roof penetration. 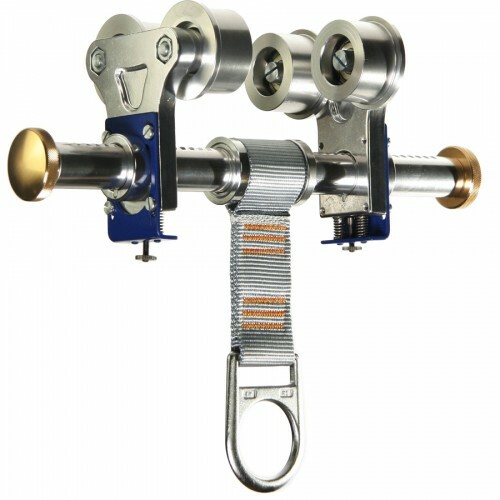 The weights are broken down into manageable sizes and are moved around in a cart that often comes with the system. The catch here is making sure your employees are properly trained in assembling the anchor point. While not particularly difficult, assembly is more involved then wrapping a strap around a beam or tightening a clamp. Some manufacturers now produce a “door bar”. This metal bar is adjustable in size and is wedged into place on the far side of a door or window jamb from where the work will take place. 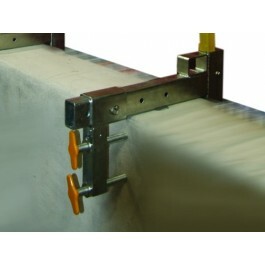 Used properly, the door bar can be a quick, easy, and effective solution. A separate scenario in which anchor points are difficult to find is vertical entry into something such as a manhole. With the necessary retrieval equipment in place, adding additional lanyards could become cumbersome. Fall protection isn’t always required in these situations, but when it is, the simplest solution is to use your retrieval tripod, IF it is also designed as a fall protection device. 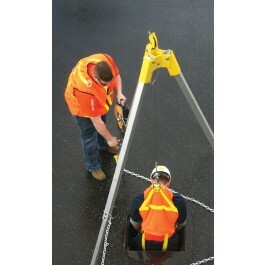 A common mistake is the assumption that all tripods provide fall protection. This is not true. In the event of a fall, a retrieval tripod that was not designed for fall protection would just continue to unravel until the employee struck the lower level. Make sure that if you are depending on your tripod, you check the manufacturer’s information to determine if it is suitable for that use. If it is not and you come across this situation often, it could well be worth your while to invest in a tripod that acts in both capacities. Roof carts operate under similar principle to the roof stanchions mentioned earlier – weights in the cart help counteract the weight of the personnel attached. However, these carts are also designed with “feet” that will dig into the roof, or lodge in the fluting of the metal deck, in the event of the fall. These carts appear simple, but have some nuances that are important to understand. 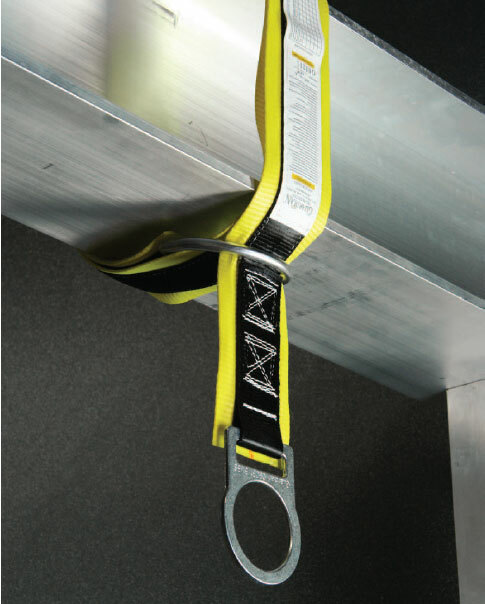 For instance, many are designed with anchor points that allow for a certain number of employees using the cart for fall arrest and an additional anchor(s) for at least one employee using it for travel restraint. Understanding the cart’s capacity is of the utmost importance. In addition, it’s important to know which direction the cart should be facing based on the type of surface on which it’s resting. Do not attempt to use these (or any fall protection equipment, really) without reading the manufacturer’s instructions and/or being properly trained. Sometimes, if not often on commercial structures, there is a parapet, but it’s just not high enough to count as fall protection, according to the OSHA regulations. In this instance, you may opt to use parapet clamp anchors. These are similar to the parapet clamps you may see being used as bases for guardrail, but some are also designed to be anchor points. Again, ensure that you are using one designed for this purpose because a parapet clamp intended to only be used as a rail base will not offer you protection as an anchor. Some operations are a bit different and require a different approach altogether. 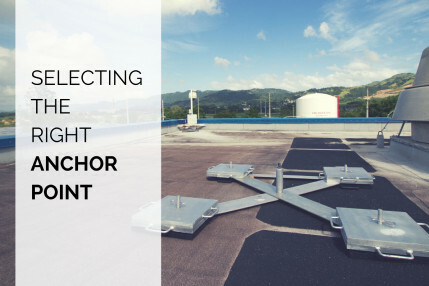 For instance, in truck washing situations, unloading operations, or rail yard work (to name a few) it may be just as difficult to locate a suitable anchor as it would be during some types of roofing work. For these applications, you may choose to use a rigid lifeline system. While some of these systems are designed as permanent installations, others are wheel-mounted so they can be moved from one part of the operation to the next. The fact remains that with each passing day, more and more technological advances occur that make the lack of fall protection indefensible. The ones listed above are only some of the products available for use. Many roofing companies still opt to use the warning line and monitor system even when actual protection is available. 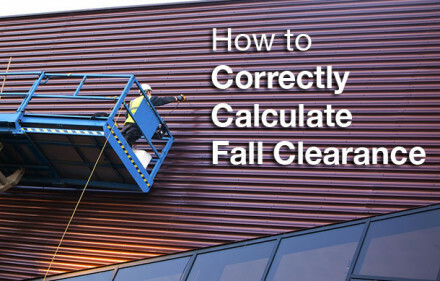 Sit down and assess your fall protection needs. Find out what options are available to you. Ensure that your employees’ lives are protected. Perhaps then we can knock “falls” off the top of that fatality list.